This article's also being posted as part of Row Three's Dirty Thirties Movie Marathon. Check it out here. I will return to silence (perhaps a blessing, at least for those who know me) this Sunday. That’s Carl Denham’s promise as he storms out of a business meeting and into the New York City night. He’s a movie director; the type who makes BIG pictures; always exciting, always 100% authentic, filmed on location. Adventure, folks: straight from the planet’s last corners of untouched savagery, captured by the lens, offered to you. He’s got the funding, the equipment, and a boat ready to set sale for his next shoot. All he needs now is a girl. “STRICT-ly business,” Denham assures Ann Darrow, the indigent beauty he finds on the street that very evening. His boat leaves in hours, to where he can’t say, but Ann’s welcome to come along. She barely hesitates. “There are a lot of girls like me,” she explains, describing her place in the legions of Depression-struck unemployed, from whose ranks Denham has deigned to pick her. She has looks, but no support, and better the risks of a voyage than the life of a thief. We know what she’s in for. Ann Darrow (Fay Wray) will spend much of the next ninety minutes in the clutches of a 50-foot ape. She’ll take a terrifying trip to the top of a tower. She’ll scream twice for every single sentence of dialogue she’ll speak. This is King Kong, a film needing no introduction. Our only question, really, is what spectacle remains in the ‘special-effects wonder’ of.... 1933? Oh, much. Enough for a few more adjectives than Denham would have called for. ‘Smart,’ for example. ‘Abstract,’ perhaps. Always interesting. And a reminder, if it’s needed, that today’s FX wizards may be jumping their own CGI-generated shark. But for now, more plot. Lack of a love interest provided the only pause in the public’s otherwise uninterrupted stream of hyperbolic praise for Denham’s pictures. And this Ann will solve. Now his ship can steam for the South Seas, headed for a possibly fictional island his old-salt of a captain has never heard of. Nothing can go wrong. But if it does, Denham’s loaded this tub with an arsenal of rifles and gas bombs big enough to pause a herd of moose. This concerns the ship’s grim-faced first mate, John Driscoll, but then, he approaches everything with a sour disposition. Even falling in love with Ann seems to irk Driscoll, though he manages it. Driscoll balks at bringing Ann to the lost island, but of course, they’re both Denham’s employees, and the director has learned to be ready to shoot at all times. In more than one sense. On the beach they discover an enormous wall, spanning the width of the peninsula, and before it, a native ceremony in full swing, with drummers, chanters, and dancers in gorilla furs circling a young woman. She will be the bride of Kong (whatever that is). The natives quickly turn their attention to Ann, whom they call ‘the golden woman.’ Denham and crew escape the beach, but Ann is captured that night and the ceremony resumes. The natives open the gates of the great wall and lash Ann to two pillars on the other side. Everyone waits. We hear, along with Ann, the roar of the beast, and the crunch of its steps approaching her. The trees part and it appears, plunging its Bride into shrieking terror, and us, into giggles. For a second, yes. We’re in the post-Jurassic Park era, after all; we’ve a tendency to knock off points when a fake monster looks fake. Kong sure does. His stare is empty and his movements are machine-like and repetitive. But give him a minute. Ann screams and screams. She writhes against her bonds, trying to twist herself away from the monster’s hand. The monster pounds its chest and roars above her. We know how we’d feel if we were screaming like that. And Kong’s alien look—his strange gestures and bugged eyes and rippling fur from hundreds of animators’ hands re-adjusting the model—all of it, makes Kong more horrific. Nobody’s playing this for laughs; so now, neither are we. 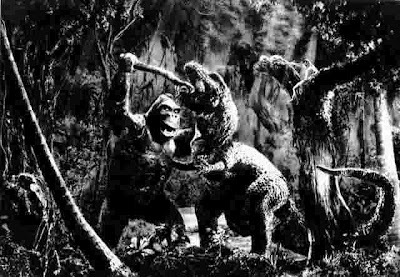 One of the crucial choices made by King Kong’s directors, Merian C. Cooper and Ernest B. Schoedsack, was to allow the victims’ screams to continue even when cutting to a shot at the monsters’ scale. Take a later scene, when the sailors pursuing Ann are mauled by a dinosaur. Cooper and Schoedsack use dummies to represent the men. They’re obvious fakes, but they wail as they’re ‘killed,’ so we remember the people we saw before, not the props we see now. Kong obsesses over Ann, and destroys all who follow her. He brutally kills a Tyrannosaurus rex, then a lizard creature, then a pterodactyl, as each threatens her. He also overturns a log bridge, consigning a half-dozen screaming dummies to the pit and leaving only Driscoll and Denham alive. Denham heads back for help, while Driscoll pursues the gorilla. And the gorilla? He takes Ann to a cliff-top—the highest point of the world he knows—and roars his victory. What follows is one of cinema’s most violent scenes. Driscoll succeeds in rescuing Ann, but the gorilla gives chase, crashing through the huge gate, rampaging through the native village and killing hundreds. Now the body count is measured in close-ups, as we see spearmen crunched in Kong’s teeth and squashed beneath his feet. No one is strong enough to stop him. Only modern technology—Denham’s gas bombs, specifically—can put the monster out. Like the other males in King Kong (giant gorilla included), Denham acts true to his nature. He sees opportunity and directs the ship’s captain to take the beast home. Cooper and Schoedsack decline to show how this is done. It truly doesn’t matter; it’s enough to know that it occurs. So when Denham stands on the beach and promises a marquee, that marquee is the next thing we see. And King Kong drops none of its breathless pace. Denham now stands in a tuxedo and tails, before a curious audience and an enormous curtain. 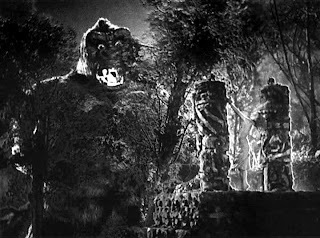 When the curtain is lifted, we see Kong on a massive platform, chained in a posture similar to Ann’s when they were betrothed. Denham then introduces Ann and Driscoll, and invites the press to close in for photos. When the camera flashes agitate the gorilla, Denham urges calm: “we’ve knocked some of the fight out of him.” Driscoll’s worried, though; what if Kong thinks the flashes are threatening Ann? He’s right, and Denham’s wrong, and Kong bursts free of his chains and begins his tear through the streets of Manhattan. Everything Kong destroys, he destroys for a reason. It was this way on the island, and so it is in New York. He wrecks a subway car because it comes at him at eye level, just like the monsters he’s used to. He crushes the men in suits as he did the men in grass skirts, because they pose equivalent danger. Consider the film’s most terrifying scene, where Kong climbs an apartment building, reaches through a high-rise window, and snatches a screaming woman from her bed. He holds her over the street, sniffs her, then drops her. It’s an awful murder, but Kong is merely an animal, looking for a different woman. Kong acts logically. King Kong is a logical film. And that makes its main character much more than a mindless, destructive force for the hero to kill. This movie’s shown us men who were stupid, greedy, short-sighted or cowardly. If they killed, or stole, or ran away, it was of their own free will. But when Kong, with Ann in hand, begins his climb up the Empire State Building, it is the last act in a film filled with his heroism. Kong is the film’s only, truly noble male. Whereas Denham endangers Ann repeatedly, and Driscoll, in the end, follows orders, Kong always puts Ann’s welfare first. Only Kong has to face the biplanes and their machineguns. 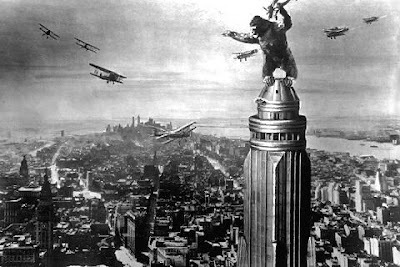 Kong’s duel with the planes completes King Kong’s vision of New York as a jungle writ-large. The gorilla climbs the Empire State Building because it is the tallest structure around. In fact, the building was, in 1933, the tallest building on earth. The metaphor is simple—as the ultimate alpha male, Kong must attain the highest point of whatever world he knows. And having been brought to the Big Apple, that’s now all the world there is. Kong tries in vain to swat the planes while protecting his woman. The pilot’s technology seems underhanded—they’re out of Kong’s reach when they shoot him, and we cheer when he manages to destroy one. When the last bullet finishes Kong, he reaches for Ann, then falls hundreds of feet to his death. He was too good for this soft, urban world anyway. A little known fact: In the scene where Ann is about to be sacrificed to Kong, the natives who phyically manhandle her were white guys in blackface. I'll let others speculate why. Richard Barthelmess plays a Chinese man opposite Lillian Gish in Broken Blossoms... there's several people of Asian descent surrounding him most of the time. Very weird effect. KING KONG is an awesome movie, even after 80 years. Don't agree with the "fake" references, otherwise a fairly good review. I don't see the effects in KING KONG the way this reviewer does; I think they're remarkable, even after 80 years. As to the blackface comment - not true; those are actual black actors, as are all the natives. Someone's overeworked PC imagination is getting the best of him. Very interesting write-up! Except for two things: I have never been "plunged into giggles" at Kong's appearance, and don't cheer when he kills the two airplane pilots. The tragedy is that neither Kong nor the pilots are in the wrong and both their deaths are unfortunate.